The term “lower blepharoplasty” includes a collection of surgical techniques that aims to improve the appearance of the lower eyelids. 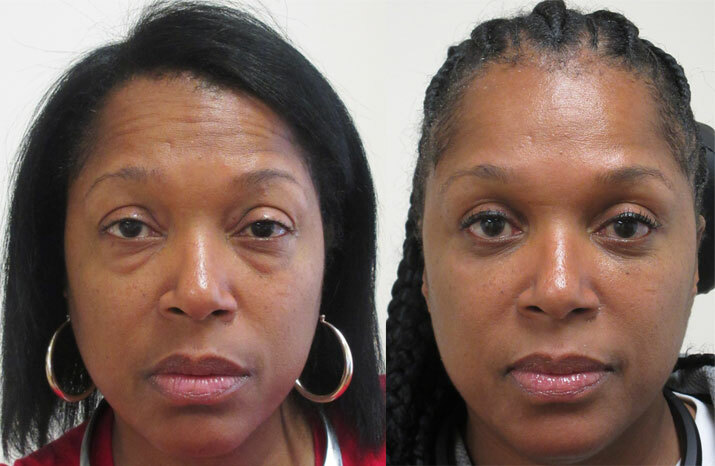 Historically, lower blepharoplasty was a reductive procedure in which skin and/or fat was removed in order to reduce lower eyelid wrinkles, skin redundancy, and fat bulges. While fat and skin excision is still performed with modern lower blepharoplasty , present trends follow a tissue-preserving philosophy that may include orbital and sub-orbicularis fat repositioning and fat transfer techniques to restore apparent volume loss associated with facial aging. Upper lid blepharoplasty is a common procedure for restoration and rejuvenation of the upper eyelids that can be performed safely and reliably. Understanding the anatomy and aging process of the brow-upper lid aesthetic unit along with properly assessing the excesses and deficiencies of the periorbital region helps to formulate an appropriate surgical plan. Volume deficiency in the aging upper lid may require corrective augmentation. Blepharoplasties are performed on an outpatient basis. That means you can go home shortly after the procedure. General anesthesia is only used for some people. Your surgeon will usually inject a numbing agent into your eyelids. The upper eyelids are addressed first. Here, your surgeon will make a small cut and remove excess skin, as well as muscle and sometimes fat. Some of these tissues might be moved to other areas surrounding the eye before your surgeon closes the incision. The lower lid blepharoplasty usually involves removal of fat, which contributes to the under-eye bags, as well as sometimes removing a small amount of skin. The incision may either be on the inside of the eyelid or on the outside underneath the lower eyelashes. In some people, the lower eyelid may be tightened or secured to the bony skeleton. Unless you’re undergoing eyelid surgery for vision concerns, insurance won’t likely cover the procedure. Talk to your doctor about all the costs involved ahead of time. 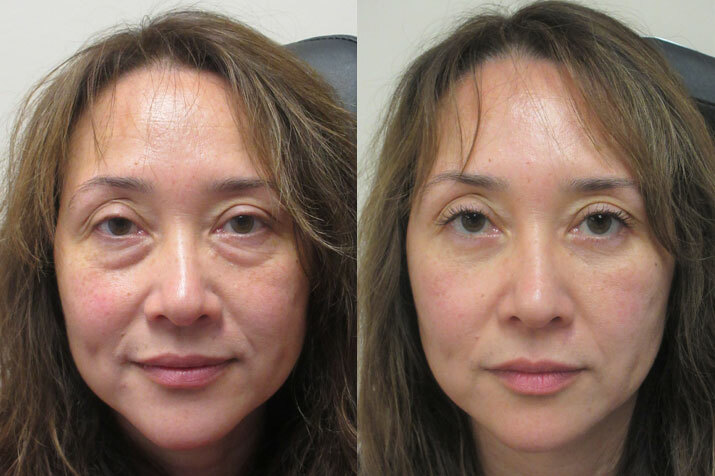 Recovery from blepharoplasty is relatively short compared with other types of surgeries. Immediately after the procedure you’ll be moved to a recovery room. You’ll be monitored for side effects and, unless there are any complications, you’ll go home the same day. It’s important to rest for a few days immediately following eyelid surgery. You might experience some swelling and pain. Your doctor may recommend you take ibuprofen to relieve these symptoms. It can take a week or two for these symptoms to fully go away. Your surgeon may also recommend ice packs for the next couple of days. Blurry vision and sensitivity to light are also possible short-term side effects. Call your doctor if these symptoms last longer than a day or two. You can’t wear contact lenses for two weeks following eyelid surgery. Be sure to have an alternative, such as prescription glasses, on hand. You don’t need to keep your eyes covered throughout the entire recovery phase, but you might be sent home with gauze to protect the area. You’ll also need to make sure you gently wash the area and keep it clean. After a few days, you’ll see the surgeon again for an evaluation and to remove any stitches as necessary. 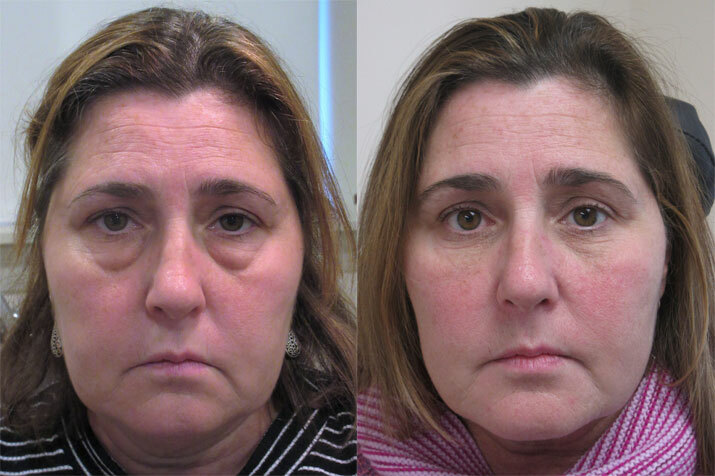 The full face photos show the dramatic improvement in her overall appearance from treating the lower eyelids. After surgery she looks refreshed and much less tired. When full face photos are compared, you can see that improving the appearance of her eyes leads to a dramatic improvement in her overall look. The improvement in her overall appearance is even more prominent in her full face photos. She looks younger and much less tired after surgery.